Hi there, and welcome to the first installment of Careful Consideration. In this series, we’re looking to focus in on those commons and uncommons in a set that really stand out in a draft environment. For the first part of the series this week, I’ll be zooming in on White and Blue; as a look through the set has shown, white is INCREDIBLY strong in this set (which is quickly becoming the norm for standard since the dawn of Khans). Blue is more synergy based, but there are a collection of high-priority pick that stand head and shoulders above the rest. This, ladies and gents, is the white premium removal of the set. At common, this stops any threat in its tracks for 3 mana, no questions asked. In Shadows over Innistrad we had Angelic Purge, which while a fantastic answer (that you’d do well to get a hold of when drafting this block), demands no additional cost for its powerful effect. Once restrained, your opponents are on a clock to get rid of the aura, before you get the mana spare to remove them, and the creature with it. Having my threat be hit by this is an intimidating proposition. In an upcoming draft environment featuring many large, splashy threats at common and uncommon, this is going to be top dollar. I favour this one for one of the better commons for white in the set, barring the Restraints. The paladin is a great threat with a fantastic body for this environment. In order to 1-for-1 it demands premium removal, as it dodges Dead Weight, Boon of Emrakul, or Incendiary Flow, all while getting underneath the white removal Collective Effort or Humble the Brute. Once this creature is on the field, it makes racing difficult by threatening a 6 life swing on contact. Lack of evasion hurts it somewhat, but there are few commons in white I would rather see. Potentially unpopular opinion, but I love the potential of this card. The closest comparison is Llanowar Mentor; An unassuming card that is a mono-green all star in the MTGO legacy cube. Powered down for standard purposes, the Standard bearer doesn’t ramp you – though it offers everything else. 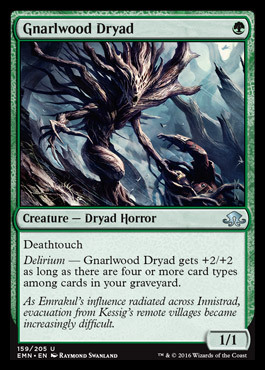 A token engine that can feed your graveyard for Delirium, or triggering madness in your other colours. Payoffs for these strategies abound in this environment, from 3/3s for G to Fiery Temper, and if you’re splashing white for whatever reason (there are plenty of reasons to do so), this is one 1/1 for one that could put in the hours. One hell of a bomb uncommon, this angel has descended to break board stalls and provide an evasive body of decent size,afterwards – if the opponent survives. Reminiscent of Ivory Giant, this can’t attack the turn that their field is tapped, but in a game where equal forces are building up on either side, this angel is the card you’ll be looking to to take you over the top and swinging for lethal. When starting out on a draft, this would provide a decent pull in the direction of white in the event that a rare doesn’t catch my eye. Special mentions to Scour the Laboratory, card draw is very strong in this set. If you can get more than two of these they quickly prove their worth, the second one being a cheaper divination and the third onwards being even more potent. These existing allow blue to thrive, hitting constant land drops to cast their eldrazi or cheaply maintaining answer options when playing defensively. I anticipate these to be in high priority when people have established a connection to blue, as they grant the Spells-matter UR archetype deadly momentum, or the UG eldrazi archetype grim inevitability. Ingenious is correct; this tricky creature is hellish for combat when facing Ux tempo builds. The interaction with +1/-1 abilities and prowess provide a constant dilemma of how much damage you’re representing versus how much you’re actually making contact with. Without spell backup this is a 3 drop that threatens 4 damage a turn; But if you represent Grotesque Mutation or Borrowed Grace, or can land a good Dance with Devils on the defensive, this skaab can support blowouts.However, it may not be for everyone, as a certain threshold of spells may be necessary in order to fully utilise its unpredictable nature. This made me snort in disbelief when I saw it. A large body? Sure. A large body WITH FLASH? Pretty good, sure. A large body WITH FLASH that is HEXPROOF on the turn it drops? Now that’s just silly. Note the wording that there is no Enter the Battlefield trigger as with other flash tricks like Archangel Avacyn or Drogskol Shieldmate; thus disallowing the ability to stop the trick and making a flash in during the attackers step more of a demoralizing blowout. Being stapled rather aggressively to a huge creature (that can cost a measly price when it Emerges) and you have the makings of a fantastic bomb uncommon. It is able to be dealt with after the initial turn, but if flashed in during your opponent’s turn it’s answer at instant speed or there WILL be at least one swing. I favour this card for a couple of reasons. First, it is a reasonably large evasive body that cantrips for cheap. Being a 3/4, as outlined earlier, works heavily in its favour, and makes a very attractive proposition in a threat. Second, It is effectively colourless. Sure, it’s expensive when hardcast, but in certain decks 7 mana is somewhat reasonable for a decent threat such as this. If your high end needs padding, look no further than this excellent example. And that just about does it for W/U folks, Crazy will pick up where I left off later in the week. If this is something you enjoy then feel free to leave feedback but until next time, catch you later.